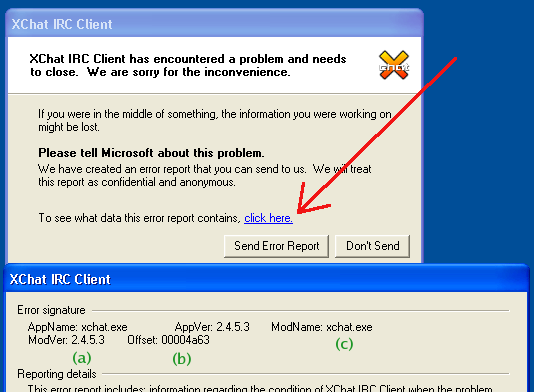 When a crash occurs, Windows should display a dialog window such as the one below. Click the "click here" link to open the second window. Please send the above by email to and try to describe what you were doing when the crash occured. X-Chat is a free program, we need your help to debug it! Use X-Chat normally, but only connect to servers via their IP number. It won't resolve hostnames while through gdb. Once a crash occurs, go back to gdb and type bt, capture the output and email it to me: .